The institution of slavery provided a critical pillar that supported the existence of both the republican and empire phases of ancient Roman society. The size of this slave population is estimated in the millions, and comprised between twenty-five and thirty percent of the total Roman population. The majority of these men, women and children worked on the farm - tilling the soil and reaping the harvest. Others, however, labored as artisans, scribes or secretaries. of a Roman slave auction. The Roman slave had no rights. They could not marry nor have a traditional family many did not even have a name. Slaves could not own property. Most had been captured during the various wars that Rome engaged in. The enemies of Rome were well aware that if captured, their inevitable destination was the slave-market. Many chose suicide as an escape. Roman slaves did sometimes attempt to rebel against their masters and gain their freedom. The most famous incident was in 73-71 BC when the gladiator Sparticus defied his master and instigated a revolt in central Italy that eventually gathered thousands of fellow slaves to his ranks. This slave army enjoyed initial success by defeating several legions sent to destroy it. Sparticus and his followers even threatened Rome itself. However, Sparticus eventually lost his life in battle and several thousand of his followers were crucified. "The total wine issue per man for a year should be about forty-two gallons:" advice for keeping slaves in Ancient Rome. For the actual laborers four pecks of wheat in the winter months, and four and a half in summer. The overseer, housekeeper, foreman and head-shepherd should receive three pecks. The chain-gang should receive four pounds of bread a day in winter, five from the time when they begin to dig the vines until the figs start to ripen, and then back to four again. For three months after the harvest, they should drink rough wine. In the fourth month, half a pint a day, or about two gallons a month. For the fifth, sixth, seventh and eighth months, the ration should be a pint a day, or four gallons a month. For the remaining four months, give them one and a half pints a day, or six gallons a month. For the feasts of the Saturnalia and Compitalia (December) there should be an extra ration per man of two and a half gallons. The total wine issue per man for a year should be about forty-two gallons. An additional amount can be given as a bonus to the chain-gang, depending on how well they work. A reasonable quantity for them to have to drink per annum is about sixty gallons. Keep all the windfall olives you can. Then keep the ripe olives from which only a small yield could be gained. Issue them sparingly to make them last as long as possible. When the olives are finished, give them fish-pickle and vinegar. Give each man a pint of oil a month. A peck of salt should be enough for a man for a year. A tunic three and a half feet long and a blanket-cloak every other year. When you issue a tunic or cloak, take in the old one to make rough clothes. You ought to give them a good pair of clogs every other year. This eyewitness account appears in: Cato, Marcus Porcius, De agri cultura liber (1882); Bradley, K.R., Slavery and Society at Rome (1994); Wiedemann, Thomas E. J. , Slavery (1987). 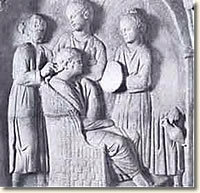 "Slavery in Ancient Rome, 170 BC" EyeWitness to History, www.eyewitnesstohistory.com (2010).